Get the job offer from the Elementary & Secondary Education Department KPK Jobs 2019 PTS Online Form. Applications are on the way to the KPK applicants who are looking for the institutional jobs so tap to this page because Elementary & Secondary Education KPK Jobs are announced for which it is seeking to hire the well disciplined, caliber and adroit applicants are required to apply for the following posts given below. 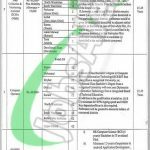 Latest Jobs in Elementary and Secondary Education Department KPK which need to be filled by the vacancies (Data Collection & Monitoring Assistant (DCMA) (Female), Data Collection & Monitoring Assistant DCMA (Male), Computer Operator, Assistant Android Developer) are the posts which need to be filled by the applicants for the project named as Independent Monitoring Unit (IMU). The overall qualification which is required for these posts includes BA /BSc / Bachelors is required to apply. Age limit should be 21-35 years. Only KPK domicile holders are welcome to apply for these posts. Applicants will be hired on a contract basis which will be extended on account of applicants performance. Now, let's head towards its applying criteria below. Candidates may apply online at the official site of PTS which is www.pts.org.pk. PTS shall charge Rs. 115/- as processing fee and administrative cost for every application form, from the applying candidates. Applications along with paid deposit slip of processing fee should reach PTS Head Office 3rd Floor, Adeel Plaza, Fazal-e-Haq Road, Blue Area, Islamabad. The last date for submission of application is March 01, 2019. Information about Roll Number & PTS test date and timing will be dispatched to the official site of PTS before one week of PTS test. Last Date To Apply: March 01, 2019.